Upland humid tropical forest soils are often characterized by fluctuating redox dynamics that vary temporally and spatially across the landscape. An increase in the frequency and intensity of rainfall events with climate change is likely to affect soil redox reactions that control the production and emissions of greenhouse gases. We used a 24-day rainfall manipulation experiment to evaluate temporal and spatial trends of surface soil (0–20 cm) redox-active chemical species and greenhouse gas fluxes in the Luquillo Experimental Forest, Puerto Rico. Treatments consisted of a high rainfall simulation (60 mm day−1), a fluctuating rainfall regime, and a control. Water addition generated high temporal and spatial variation in soil moisture (0.3–0.6 m3 m−3), but had no significant effect on soil oxygen (O2) concentrations. Extractable nitrate (NO3 −) concentrations decreased with daily water additions and reduced iron (Fe(II)) concentrations increased towards the end of the experiment. Overall, redox indicators displayed a weak, non-deterministic, nonlinear relationship with soil moisture. High concentrations of Fe(II) and manganese (Mn) were present even where moisture was relatively low, and net Mn reduction occurred in all plots including controls. Mean CO2 fluxes were best explained by soil C concentrations and a composite redox indicator, and not water addition. Several plots were CH4 sources irrespective of water addition, whereas other plots oscillated between weak CH4 sources and sinks. Fluxes of N2O were highest in control plots and were consistently low in water-addition plots. Together, these data suggest (1) a relative decoupling between soil moisture and redox processes at our spatial and temporal scales of measurement, (2) the co-occurrence of aerobic and anaerobic biogeochemical processes in well-drained surface soils, and (3) an absence of threshold effects from sustained precipitation on redox reactions over the scale of weeks. Our data suggest a need to re-evaluate representations of moisture in biogeochemical models. SJH designed and performed the study and wrote the paper, WLS contributed to design and writing, WHM contributed to analysis and writing. Humid tropical forests exert substantial influence on the atmospheric concentrations of the greenhouse gases carbon dioxide (CO2), nitrous oxide (N2O), and methane (CH4). These ecosystems generate the highest soil-atmosphere CO2 fluxes of any biome, provide the largest natural source of N2O, and are increasingly thought to provide a substantial net source of CH4 (Matson and Vitousek 1990; Raich and Schlesinger 1992; Carmo and others 2006; Bloom and others 2010). Although the net C balance of humid tropical forest soils remains uncertain, they contain a significant portion (approximately 500 Pg) of the terrestrial organic carbon (C) pool (Jobbagy and Jackson 2000). Global climate change is likely to affect soil C storage and greenhouse gas fluxes from humid tropical forest soils, yet the relative impact of different environmental drivers remains poorly understood. The stimulation of organic matter decomposition rates under increasing temperatures has been widely acknowledged (Davidson and Janssens 2006), but the biogeochemical impacts of altered precipitation regimes have received less attention. Drought can potentially increase or decrease soil respiration in humid tropical forests (Wood and Silver 2012; Cleveland and others 2010), but potential consequences of short-term variability in precipitation (days to weeks) have not yet been closely examined. Theoretical and empirical evidence points to an increase in the frequency and magnitude of extreme precipitation events with global climate change (Karl and others 1995; Romps 2011). Variability in soil moisture has long been known to impact soil oxygen (O2) concentrations, especially in the humid tropics where increased rainfall often correlates with declines in O2, presumably due to decreased gas-phase diffusion (Vine and others 1942; Silver and others 1999). Rainfall-induced variability in O2 concentrations could generate important feedbacks on the redox-sensitive biogeochemical reactions controlling soil greenhouse gas production. Oxygen provides the most energetically favorable electron acceptor for microbial respiration, and directly inhibits production of N2O and CH4 due to lower energy yields from denitrification and methanogenesis (Megonigal and others 2003). Although the importance of anaerobic biogeochemical cycling of C, nitrogen (N), manganese (Mn), iron (Fe), and sulfur (S) have long been documented in wetland ecosystems (Ponnamperuma 1972), the significance of anaerobic processes such as Fe reduction and methanogenesis has only recently been recognized in upland humid tropical forest soils (Peretyazhko and Sposito 2005; Teh and others 2005; Chacon and others 2006). Understanding the environmental drivers of aerobic and anaerobic biogeochemical reactions in upland humid tropical forests could provide insight into dynamics of soil greenhouse gas fluxes from these ecosystems. The presence of soil moisture concentrations above field capacity or flooded conditions are typically accepted as critical constraints for inducing soil O2 depletion. Water table depth and time since flooding have provided effective proxies for redox conditions and CO2 and CH4 fluxes across a range of wetland ecosystems (Ponnamperuma 1972; Jungkunst and Fiedler 2007). Studies in upland soils have also shown suppression of soil respiration by high soil moisture, presumably due to O2 depletion (Linn and Doran 1984). Because soil moisture is a relatively tractable variable, relationships between moisture and redox processes have been incorporated into mechanistic models used to describe soil redox dynamics, organic matter decomposition, and trace gas fluxes (Li and others 1992; Parton and others 1993). Building on research in temperate ecosystems, work in the humid tropics has suggested that soil moisture dominantly influences the redox reactions that control greenhouse gas fluxes. Several studies suggested that suppression of microbial organic matter decomposition under anaerobic conditions could explain observations of declining CO2 fluxes under high soil moisture, in addition to the impact of decreased diffusivity (Schuur and Matson 2001; Chambers and others 2004; Cleveland and others 2010). Fluxes of N2O from humid tropical forest soils often exhibit positive relationships with soil moisture indicative of stimulated denitrification rates (Keller and Reiners 1994; Erickson and others 2001; Koehler and others 2009; Rowlings and others 2012). And, although humid tropical soils have previously been thought to provide a net CH4 sink in the absence of disturbance (Keller and Reiners 1994; Steudler and others 1996; Rowlings and others 2012), recent data suggest the presence of a cryptic CH4 source in these ecosystems likely related to moisture variability (Teh and others 2005; Carmo and others 2006). Other studies demonstrated that rainfall can shift soils from CH4 sinks to sources (Vasconcelos and others 2004; Yu and others 2008; Itoh and others 2009), and it is unknown whether this relationship is widespread. In particular, we ask whether variation in the magnitude and duration of rainfall and soil moisture is sufficient to explain dynamics of redox reactions and greenhouse gas fluxes in upland humid tropical forests. The relationships between moisture and greenhouse gas fluxes discussed above are underpinned by theoretical differences in the thermodynamic energy yield of soil microbe-catalyzed redox reactions. Theory suggests that electron acceptors should be reduced in a predictable sequence, provided that microbes compete for electron donors (for example, labile C) in a spatially homogeneous environment. Oxygen should be respired first, followed by nitrate (NO3), manganese oxides (Mn(IV)), iron oxides (Fe(III)), sulfate (SO4), and finally CO2 (Megonigal and others 2003). The terminal electron-accepting process (TEAP) model posits that dominant redox processes can be identified by evaluating spatial or temporal trends in the concentrations of electron acceptors and reduced products (Chapelle and others 1995). This framework provided insight into understanding the dynamics of redox reactions and greenhouse gas production across diverse wetland, sediment, and aquifer ecosystems (Achtnich and others 1995; Chapelle and others 1995; Hedin and others 1998; Yu and others 2007). As O2 and other terminal electron acceptors are successively depleted, the production of CO2, N2O, and CH4 often varies characteristically over time. Carbon dioxide production typically decreases monotonically, N2O production peaks and then declines, and CH4 production exhibits a threshold increase after other terminal electron acceptors have been depleted (Achtnich and others 1995; Yu and others 2007). The utility of this model to predict temporal and spatial patterns of redox reactions and greenhouse gas fluxes remains largely untested in upland humid tropical soils. Well-drained upland humid tropical forest soils can experience sub-atmospheric O2 concentrations due to a combination of high moisture and respiration rates. Soil O2 concentrations in Puerto Rican forests correlated with differences in total rainfall at a landscape scale and with temporal variability in rainfall within sites over days to weeks (Silver and others 1999; Liptzin and others 2011). However, the relative influence of soil moisture on redox reactions and greenhouse gas fluxes has not been tested in these ecosystems, especially as compared with other soil characteristics such as C concentration. Given the rapid infiltration rates characteristic of these soils (McDowell and others 1992) and the potential for infiltrating water to supply dissolved O2 to microbes, we expect a more nuanced relationship between rainfall, soil moisture, and redox processes in this ecosystem. Here, we tested the influence of soil moisture on redox reactions and greenhouse gas fluxes using a 24-day water-addition experiment to amplify differences in soil moisture among plots. This timescale is relevant to the underlying periodicity of rainfall and O2 fluctuations in this ecosystem, given that sustained periods of high precipitation and bulk soil O2 depletion occur on scales of days to weeks (Heartsill-Scalley and others 2007; Liptzin and others 2011). Our 24-day water-addition treatment represents an extreme but plausible end-member of potential rainfall scenarios. Dominant redox processes can shift over scales of days to weeks in wetland ecosystems (Achtnich and others 1995; Ratering and Conrad 1998), and we predicted similar rapid responses in our tropical forest ecosystem given the facultative anaerobic capacity of the endemic microbial community (Pett-Ridge and Firestone 2005). We compared patterns in the concentrations of electron acceptors (O2, NO3, and SO4) and reduced products (Mn(II), Fe(II), and soil CH4) as relative indicators of redox reactions. We predicted that sustained high soil moisture would deplete electron acceptors, correlating with a decline in CO2 fluxes, a brief period of elevated N2O fluxes, and an eventual increase in CH4 fluxes. We also predicted that shorter periods (days) of high soil moisture would suppress CO2 fluxes, but would be insufficient to deplete electron acceptors and stimulate net positive CH4 fluxes. We conducted our experiment in the Bisley Watershed of the Luquillo Experimental Forest, Puerto Rico (18.3°N, −65.8°W), an NSF-funded Long-Term Ecological Research and Critical Zone Observatory site. This subtropical wet forest ecosystem experiences a long-term mean precipitation of 3500 mm y−1 and mean annual temperature of 23°C (Scatena 1989). Seasonal variation in rainfall is relatively low, with a minimum in March (5.6 ± 0.7 mm day−1) and maximum in May (11.7 ± 1.3 mm day−1) from 1988 to 2003 (Heartsill-Scalley and others 2007). Extreme precipitation events exceeding 100 mm day−1 can occur during any month, and most years experience several weeks of precipitation above 30 mm day−1. Inter-annual precipitation is highly variable, ranging from 2600 to 5800 mm y−1 between 1989 and 2011 (F. Scatena, unpublished data). Bisley watershed soils are ultisols supporting mature closed-canopy forest dominated by tabonuco (Dacryodes excelsa) and sierra palms (Prestoea montana) (Huffaker 2002). Overland flow of water is rare in these upland soils given that infiltration rates (0.07–1.5 cm min−1) typically exceed rainfall (0.1 cm min−1; McDowell and others 1992). Soil depth varies with topographic position in the Bisley watersheds and measures approximately 40 cm to saprolite in our experimental site. Surface soils (0–20 cm) have mean clay, silt, and sand contents of 39, 51, and 11%, respectively (T. Natake, unpublished data), with a mean bulk density of 0.7 g cm−3. We established 18 plots measuring 1.25 × 1.25 m within a 20 × 30-m area in an upland valley (Scatena 1989). Plots were assigned to one of three treatments: daily water additions for 24 days (“continuous” treatment); a regime consisting of 8 days of water addition followed by 8 days of throughfall exclusion and a final 8 days of water addition (“fluctuating” treatment); an un-manipulated control. Plot size was chosen to allow high replication within a relatively homogeneous landscape position while minimizing soil variability within a plot, and we positioned plots to avoid effects of downslope water movement. Throughfall was excluded for 8 days in the fluctuating treatment using transparent plastic shelters suspended 1 m above the plot surface. Each simulated rainfall event amounted to the addition of approximately 60 mm day−1 of water collected from a nearby first-order stream. This water-addition regime represents a high but realistic amount of precipitation that normally occurs for at least 1 week per year (Heartsill-Scalley and others 2007). Water was added via perforated transparent plastic trays suspended approximately 10 cm above the plot surface, from which water slowly percolated onto the soil. Trays were removed from plots between watering events. Our 24-day continuous watering treatment provided an end member of realistic precipitation patterns to test the response of redox reactions to sustained precipitation inputs. We conducted the experiment during October 2010. Soil moisture and O2 concentrations were measured quasi-continuously in each plot (n = 18) at 30-minute intervals for 2 months prior to and during the experiment using time-domain reflectometry (Campbell Scientific, Logan, Utah) and galvanic cell sensors (Apogee Instruments, Logan, Utah) connected to a datalogger. Oxygen sensors were calibrated to local pressure and mean soil temperature at 100% relative humidity, and were installed inside equilibration chambers consisting of 10-cm-long polyvinyl-chloride tubes (5 cm diameter) with an open bottom and sealed top with a sampling port (three-way stopcock). These chambers were installed at a depth of 10 cm after removing an equivalent volume of soil, and 30 ml of headspace gas was sampled with a syringe at 4-day intervals throughout the experiment to measure concentrations of CO2, N2O, and CH4 (see below). Temperature sensors were installed at a depth of 10 cm in a subset of plots (n = 2 per treatment). Moisture sensors provided an integrated measurement of the 0–20 cm depth, the predominant location of roots and organic matter in this ecosystem (Odum and others 1970). Soil-atmosphere fluxes of CO2, CH4, and N2O were measured in each plot immediately prior to the experiment and at 2-day intervals thereafter using a vented static flux chamber technique (total n = 234), with chamber collars removed between measurements. Chamber collars (26 cm diameter) were installed to 3 cm depth and removed 2 months prior to the experiment. Collars were subsequently installed in the same positions during measurements to minimize artifacts due to root mortality and decay (Keller and others 2000). Mean height of the collar and chamber assembly was 18 cm. Gas concentrations were measured using a gas chromatograph (Shimadzu, Columbia, Maryland) equipped with a flame ionization detector, thermal conductivity detector, and electron capture detector for CH4, CO2, and N2O, respectively. Fluxes were calculated by fitting gas concentration data from five samples collected over 40 min to a model derived from Fick’s first law (Matthias and others 1978). This nonlinear model accounts for inhibitory effects from increasing gas concentrations on fluxes throughout the measurement period. Soils were sampled for chemical extraction prior to the experiment and at 8-day intervals thereafter. We composited three replicate 1.6-cm-diameter soil cores (20 cm depth) for each plot. Separate replicate subsamples of each soil were extracted for 60 min in 1:10 slurries of 0.5 M hydrochloric acid (HCl) and filtered to 0.22 μm for Fe(II) and Mn analysis, and 1:5 slurries of potassium chloride and ammonium acetate were extracted and filtered to 10 and 0.22 μm for analysis of nitrate (NO3 −) and sulfate (SO4 2−), respectively. Potassium chloride extractions were subsequently combined with a phosphate solution and filtered to 0.45 μm to eliminate analytical interference from Fe (Yang and others 2012). We assumed that HCl-extractable Mn predominantly represents divalent reduced Mn (Mn(II)). We measured Fe(II) using a ferrozine assay accounting for interference from Fe(III) (Viollier and others 2000), Mn using inductively coupled plasma atomic emission spectroscopy, NO3 − using cadmium reduction and colorimetry, and SO4 2− using ion chromatography. Soil solutions were sampled from tension lysimeters (Prenart Super Quartz, Denmark) installed within 20 cm of the center of each plot at a depth of 10 cm. We sampled lysimeters at 4-day intervals when yield was sufficient, filtered (pre-combusted Whatman GF-F), and frozen prior to analysis at University of New Hampshire by ion chromatography and combusted for measurement of dissolved organic C (DOC) on a Shimadzu TOC-V. We acidified a subset of soil solution samples with HCl to pH below 2 in the field for Fe(II) analysis (as above) when sufficient volume was available. Soil C was measured in pre-treatment samples (air-dried and ground) from all plots by combustion on a CE Elantech elemental analyzer (Lakewood, New Jersey). We modeled soil diffusivity for CO2 using the Millington and Shearer (1971) model for aggregated porous media, incorporating diffusion through inter-aggregate and intra-aggregate pores. We estimated intra-aggregate porosity using volumetric soil moisture content at field capacity determined 2 days after a saturating rainfall event (Davidson and Trumbore 1995). Replicate measurements of field capacity among plots agreed closely (slope = 0.95, R 2 = 0.96). Response variables were analyzed using mixed-effects models that incorporated random effects for plots and temporal autocorrelation implemented using the nlme library in R (Pinheiro and others 2011). The optimal random effect structure was selected using likelihood ratio tests after saturating the model with fixed effects. Fluxes of CO2 and N2O were log-transformed and fourth-root transformed, respectively, to satisfy model assumptions. Nonlinear trends were analyzed using additive mixed models implemented in the mgcv package in R (Wood 2006). Briefly, additive models fit a non-parametric smooth function to data with an optimum complexity chosen by an information criteria approach. For these models, we describe the significance, approximate variance explained, and approximate degrees of freedom (d.f.) of the smooth function, which provides a measure of the curvature of the function. For example, a smooth function with three d.f. would have three inflection points. In addition, we summarized the co-variation among redox species sampled within a given plot using principal components analysis. The continuous water-addition treatment maintained soils above field capacity for the duration of the experiment, whereas the fluctuating and control treatments exhibited a pronounced decline in soil moisture (0.2 m3 m−3) during the middle 8 days of the experiment coinciding with a period of low rainfall, and a subsequent increase in moisture to initial levels (Figure 1). Water addition to the fluctuating treatment did not increase soil moisture relative to the controls, likely due to several substantial (>20 mm) rain events at the beginning and end of the experiment. The continuously watered plots had slightly but significantly greater soil moisture than the other treatments before the experiment. Mean daily soil temperature averaged 24.3°C and varied by less than 1°C over the experiment, and did not differ among treatments. Precipitation and soil moisture (m3 m−3) ±SE by treatment. The period of treatment application is shown in the shaded rectangle. Oxygen concentrations were not significantly affected by either water supplementation treatment and showed relatively little temporal variation as compared with the other redox species (Figure 2). To account for spatial variation among plots, we report all redox species and gas flux data normalized to pre-treatment levels. Our additive model of O2 concentrations showed a significant nonlinear increase over time that was similar across all treatments (P < 0.05, smooth function with approximately 1.4 d.f.). Soil NO3 − concentrations were initially similar among treatments and approximately doubled in the control and fluctuating treatments over the experiment, whereas NO3 − in continuously watered treatments measured only 44% of the other treatments in the final samples (treatment contrast P < 0.05, Figure 2B). Lysimeter NO3 − concentrations were initially low but increased significantly during the middle of the experiment in control and fluctuating treatments, coinciding with a decline in soil moisture (Figure 2F). Lysimeter NO3 − remained consistently low in the continuously watered treatment, and lysimeter NH4 + concentrations declined significantly in all treatments over the experiment (Figure 2G). Soil atmosphere concentrations of O2 at 10 cm (A), KCl-extractable soil NO3 (B), HCl-extractable Mn(II) and Fe(II) (C, D), and ammonium acetate-extractable SO4 (E). The right-hand column shows lysimeter concentrations of NO3 (F), NH4, (G) Fe(II) (H), SO4 (I), and dissolved organic carbon (J). Data (±SE) are normalized to pre-treatment values. Net Mn reduction occurred in all treatments, with final extractable Mn(II) concentrations reaching 182, 159, and 150% of initial concentrations in the control, fluctuating, and continuous treatments, respectively (time effect P < 0.001, Figure 2C). Soil Fe(II) concentrations were largely static in control and fluctuating plots, but Fe(II) concentrations increased by 98% in continuously watered plots from Day 18 to 25, reflecting considerable net Fe reduction (treatment by time interaction, P < 0.05, Figure 2D). In contrast, lysimeter Fe(II) concentrations showed considerable temporal variability across all treatments with large increases on Days 17 and 21 (Figure 2H). Both soil and lysimeter SO4 2− concentrations showed the least temporal variation of all the redox species (Figure 2E, I). Lysimeter DOC concentrations generally showed similar trends among treatments, but showed a secondary peak in the fluctuating treatment on Days 21 and 25 (Figure 2J). Control and continuously watered plots had similar DOC concentrations over most of the experiment. Oxygen concentrations displayed a significant nonlinear pairwise negative relationship with soil moisture (R 2 = 0.33, P < 0.0001, smooth function with 3.7 d.f., Figure 3A). Oxygen concentrations below the detection limit were occasionally recorded above 55% soil moisture (Figure 3A). Continuous water addition was not sufficient to deplete soil O2, however, and O2 frequently approached atmospheric concentrations even at high soil moisture (>0.55 m3 m−3). Redox-active chemical species measured in the soil atmosphere and soil extractions (O2, NO3 −, Mn(II), Fe(II), and CH4) correlated according to thermodynamic predictions when analyzed together using principal component analysis; the first principal component explained 48% of their combined co-variation (Table 1). That is, lower concentrations of O2 and NO3 − were associated with increased Mn(II), Fe(II), and CH4, but not in a step-wise manner. Sulfate was not significantly correlated with the other redox species. The first principal component of redox species displayed a negative nonlinear relationship with soil moisture similar to the relationship between O2 and soil moisture (R 2 = 0.38, P < 0.001, smooth function with 2 d.f., Figure 3B). Relationships between daily mean volumetric soil moisture and O2 concentrations measured at 10 cm depth (A), and the first principal component of redox species (O2, NO3, Mn(II), Fe(II), CH4 concentrations) measured at 8-day intervals (B). PCA loading represents relationships between chemical species and the first principal component, which explained 48% of the variance among redox species. Fluxes of CO2 varied significantly over time but showed similar temporal trends across all treatments (one smooth function with 7.8 d.f. P < 0.0001). Moisture and O2 concentrations were significantly correlated with CO2 fluxes (moisture: negative correlation, P < 0.001 and O2: positive correlation, P < .04), but explained comparatively little variation (8% of the sum of squares). Instead, constitutive spatial variation in CO2 fluxes (plot random effects) accounted for 81% of the model sum of squares. Modeled diffusivity correlated only weakly with CO2 fluxes (R 2 = 0.07, P < 0.01). Soil CO2 concentrations at 10 cm were more variable than CO2 surface fluxes, especially in the control plots where CO2 declined to 33% of initial concentrations between Days 1 and 17 (Figure 4B). Changes in soil CO2 concentrations did not significantly correlate with surface fluxes. When we averaged CO2 fluxes over time by plot they correlated significantly with soil C concentrations (P < 0.01, Figure 5A) and with the first principal component of redox species (P < 0.05, Figure 5B), which together explained 62% of the variation in mean CO2 fluxes among plots. Normalized (±SE) soil-atmosphere fluxes and soil concentrations (10 cm depth) of CO2, N2O, and CH4. Pairwise relationships between greenhouse gas fluxes and covariates. Mean CO2 fluxes plotted against soil C concentrations (A) and the composite redox indicator (B). Individual N2O fluxes plotted against soil moisture (C) and O2 (D), and CH4 fluxes plotted against soil moisture (E) and O2 (F). Nitrous oxide fluxes were lowest in continuously watered plots and were highest and most variable in the control plots (Figure 4C). Fluxes of N2O were significantly related to moisture, O2, and their interaction (P = 0.01 for all three terms), with the highest N2O fluxes occurring at intermediate O2 and moisture (18% and 0.5 m3 m−3, respectively, Figure 5C, D). Dynamics of soil N2O concentrations did not follow those of surface fluxes. Soil N2O concentrations were typically highest in the continuously watered plots, whereas surface fluxes were lowest in this treatment (Figure 4D). Fluxes of CH4 were not significantly related to O2 or moisture. Although net positive CH4 fluxes typically occurred at high soil moisture (Figure 5E), positive fluxes were also observed in plots with near-atmospheric soil O2 concentrations (Figure 5F). Mean CH4 fluxes averaged over the experiment showed a significant correlation with the redox principal component (P = 0.02, R 2 = 0.30). Soil CH4 concentrations (10 cm depth) typically exceeded atmospheric levels in all plots. Research over the last decade has highlighted the importance of anaerobic metabolic processes such as Fe reduction and methanogenesis in upland forest soils (Silver and others 1999; Peretyazhko and Sposito 2005; Teh and others 2005; Chacon and others 2006; Thompson and others 2006; Fimmen and others 2008; Liptzin and Silver 2009; Dubinsky and others 2010). The spatial and temporal dynamics of redox reactions in these soils are generally assumed to vary with soil moisture. In this study, volumetric soil moisture ranged between 0.3 and 0.6 m3 m−3 among plots, yet contrary to our first prediction moisture explained comparatively little temporal variability in indicators of redox reactions, including O2, NO3, Mn(II), Fe(II), and CH4 concentrations. The temporal variation in soil moisture that we observed over the scale of days was equivalent to seasonal variation in moisture measured in other humid tropical forests (Kursar and others 1995; Koehler and others 2009; Wieder and others 2011). The relative decoupling between moisture and redox processes in this upland humid tropical forest contrasts with data from wetlands emphasizing the predominant role of moisture in controlling the spatial and temporal segregation of redox reactions (Patrick and Jugsujinda 1992; Achtnich and others 1995; Ratering and Conrad 1998; Yao and others 1999). In our study, we found that concentrations of redox species co-varied according to thermodynamic predictions within plots, but we observed little segregation of distinct redox reactions within plots over time. That is, aerobic respiration, denitrification, Mn reduction, Fe reduction, and methanogenesis all apparently occurred in close spatial proximity (within a given plot). Furthermore, extended periods of elevated soil moisture did not drive temporal patterns in redox chemical species, with the possible exception of Fe(II) concentrations which ultimately increased, and NO3 − which decreased in continuously watered plots. The co-occurrence of multiple aerobic and anaerobic metabolic processes suggests the importance of aggregate-scale spatial variation in moisture, O2, and electron acceptor availability, which facilitate the co-occurrence of multiple redox reactions that would not likely persist in a spatially homogenous environment. Although denitrification has long been known to occur within anaerobic soil aggregates in an otherwise aerobic environment (Sexstone and others 1985), we also measured considerable extractable Mn, Fe(II), and CH4 at soil moisture below field capacity concomitant with abundant soil O2 (a mean of 16% over the experiment). Net Mn reduction occurred in all treatments, including plots where moisture declined well below field capacity, and soil Fe(II) concentrations were relatively high even in these drier plots. The high affinity of these clay-rich soils for moisture and their well-developed aggregate structure could explain the persistence of anaerobic microsites even under relatively drier conditions. Fimmen and others (2008) suggested that labile C supply stimulates Fe reduction in rhizosphere soil, providing an additional mechanism for generating anaerobic microsites even when macropores contain O2. Net positive Mn and Fe reduction in a dominantly aerobic soil environment likely masks even greater rates of gross Mn and Fe reduction, given that Mn(II) and Fe(II) should oxidize in the presence of O2. Indeed, increases in soil lysimeter solution Fe(II) concentrations suggest gross Fe reduction (Fe reduction followed by oxidation) even in control plots. Concentrations of O2 and a principal component summarizing variation among measured redox species exhibited nonlinear threshold responses to moisture, but sustained high moisture did not usually deplete O2, and many plots showed near-atmospheric O2 concentrations despite sustained periods with moisture exceeding field capacity. These data suggest that high soil moisture is necessary but not sufficient to deplete macropore O2 in upland humid tropical forests. Additionally, infiltrating water could provide a significant source of O2. Our water-addition treatment could have supplied up to 2.5 g O2 m−2 day−1 if added water had completely equilibrated with soil porewater, which is theoretically sufficient to account for the majority of C oxidation to CO2 that we observed. It is likely, however, that water addition did not greatly contribute to O2 supply given the importance of rapid preferential flow in this ecosystem, which precludes substantial O2 exchange (McDowell and others 1992). In agreement with our results, water supplementation to soils in Panama caused only a small (1.4%) decrease in bulk soil O2 concentrations (Kursar and others 1995). During this experiment, we also observed soil oligochaeta (earthworm) burrowing activity that increased within minutes of applying water to plots, leaving soil casts greater than 1 cm diameter on the soil surface. Worms were documented to mitigate hypoxia in marine sediments by burrowing (Norkko and others 2011). We suggest that an increase of faunal burrowing activity following precipitation events and O2 supply from rainwater could help explain the observed decoupling between moisture and O2 in soils with moisture contents above field capacity. Combining our present data with previous research provides a more nuanced understanding of relationships between precipitation and soil O2 concentrations. Previous O2 measurements near our study site correlated negatively with cumulative rainfall measured over 28-day periods, and with trends in hourly rainfall over periods of 10–16 days (Silver and others 1999; Liptzin and others 2011). Rainfall frequency rather than magnitude had a greater influence on O2 concentrations in these studies. We hypothesize that the minimal temporal response of O2 concentrations to water addition that we documented in this study may have been partly constrained by underlying long-term rainfall dynamics: rainfall events were frequent before the study began. Consequently, constitutive spatial variation may be responsible for the highly significant pairwise relationship between moisture and O2 that we observed. The relative unresponsiveness of O2 to large short-term variation in moisture documented here suggests caution in extrapolating long-term relationships between moisture and O2 to short-term dynamics. Fluxes of CO2 and CH4 exhibited relatively little temporal variability in response to high variation in soil moisture throughout our experiment. Contrary to our prediction, sustained high moisture neither suppressed CO2 fluxes nor stimulated CH4 fluxes, suggesting the resistance of microbial C cycling processes and/or root respiration. Modeled diffusivity showed little correlation with gas fluxes, suggesting that differences in biological rates as opposed to physical constraints governed variation among plots. These results contrast with data from temperate soils with comparable C concentrations that show an inhibition of organic matter decomposition as soil moisture exceeds field capacity (Linn and Doran 1984), an assumption incorporated in prominent ecosystem biogeochemical models (Li and others 1992; Parton and others 1993). 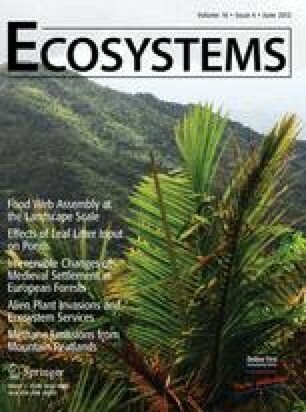 The response of humid tropical forest soil microbial communities to variation in moisture and O2 availability could be distinct from that of temperate ecosystems. In soil from our site, microbial biomass and taxonomic richness were greatest under conditions of fluctuating O2 availability relative to static aerobic conditions (Pett-Ridge and Firestone 2005). From a microbial perspective, consistently high soil moisture could represent an appropriate reference condition in this ecosystem, whereas declines in moisture might impose greater stress. Indeed, Wood and Silver (2012) recently documented a suppressive effect of experimental drought on soil CO2 fluxes from this ecosystem. Mean soil CO2 fluxes were best predicted by soil C concentrations and a principal component integrating the relative abundance of five redox-active chemical species. This model suggests that C substrate availability provides a first-order predictor of respiration that is further impacted by plot-specific differences in anaerobiosis. The principal component summarizing variation in five different redox reactions provided better explanatory power for CO2 fluxes than O2 concentrations alone, suggesting the importance of accounting for multiple co-occurring anaerobic processes in addition to aerobic respiration. Cleveland and others (2010) found a significant negative relationship between O2 concentrations and CO2 fluxes in a lowland tropical forest over the scale of months, and suggested that a combination of anaerobiosis and dilution of DOC could explain declines in CO2 fluxes under wet conditions. In our experiment, lysimeter DOC concentrations did not decline in rainfall addition treatments relative to controls, suggesting that C substrate limitation due to water addition was not likely an overriding factor over the timescale of our study. We documented significant interactive effects of moisture and O2 availability on N2O fluxes consistent with the “hole in the pipe” model, which predicts that rates of N cycling and diffusion will control N2O fluxes (Davidson and others 2000). In our study, extractable and lysimeter NO3 concentrations increased in control and fluctuating water-addition plots during periods of low soil moisture, likely fueling subsequent N2O production. High moisture and low O2 concentrations likely suppressed N2O fluxes due to decreased NO3 supply from nitrification and increased denitrification to N2. In other humid tropical forest soils, moisture correlated positively with N2O fluxes (Keller and Reiners 1994; Erickson and others 2001; Kiese and Butterbach-Bahl 2002; Koehler and others 2009; Rowlings and others 2012), but N2O fluxes often display a Gaussian distribution across the entire range of potential soil moisture characterized by declines under very wet conditions (Kiese and Butterbach-Bahl 2002; Castellano and others 2010). Our data support the results of Wieder and others (2011) and suggest that inhibitory effects of moisture on N2O fluxes may dominate in high rainfall environments. We found that sustained high soil moisture was consistently associated with high soil N2O concentrations, but low N2O fluxes suggestive of reduction to N2. The highest N2O fluxes occurred in control plots where moisture declined and subsequently increased due to rainfall events, resulting in lower soil moisture than the fluctuating plots and potentially creating an optimum combination of substrate availability, moisture, and O2 for nitrification/denitrification. Several plots showed consistently positive net CH4 fluxes over the experiment and were unaffected by water-addition treatments, whereas others fluctuated between small net CH4 sources or sinks. Surprisingly, almost all positive CH4 fluxes occurred in the presence of measurable bulk soil O2 concentrations. Liptzin and others (2011) found an inverse correlation between O2 and soil CH4 concentrations over the scale of months in nearby sites, but our present data suggest caution in extrapolating from soil CH4 concentrations to surface fluxes, as concentrations of CH4 typically exceeded atmospheric levels even in the absence of net surface efflux. Variation in CH4 oxidation may control the direction of fluxes in these soils (Teh and others 2005; Rowlings and others 2012), where several plots fluctuated between CH4 sources and sinks. Notably, however, soil CH4 fluxes did not increase in response to continuous water addition in our study. In wetland ecosystems, CH4 production is typically suppressed until alternative electron acceptors are depleted during periods of sustained flooding (Ratering and Conrad 1998; Megonigal and others 2003; Yu and others 2007). In upland humid tropical forests, spatial heterogeneity of redox processes or high electron donor concentrations could allow gross CH4 production despite the presence of alternative electron acceptors. The lack of correlation among CH4 fluxes, moisture, and bulk soil O2 concentrations further supports the importance of anaerobic microsites in controlling CH4 fluxes. We cannot rule out that CH4 is produced from soil below our measurement zone, but surface soils showed high potential methanogenesis (Chacon and others 2006) and soils are shallow (30–40 cm to saprolite) at our particular study site. In sum, our data suggest that sustained high soil moisture will not necessarily induce a spike in CH4 production in upland humid tropical soils, in contrast to wetland soils where duration of flooding appears critical for predicting electron-acceptor depletion and CH4 fluxes (Ratering and Conrad 1998; Knorr and Blodau 2009), and in contrast to a seasonally dry tropical forest where irrigation treatments sometimes stimulated net positive CH4 fluxes (Vasconcelos and others 2004). Although CH4 fluxes tended to increase with our integrated measure of anaerobiosis, concentrations of labile Fe oxides measured in a separate study (S. Hall, data not shown) typically exceeded Fe(II) pools by at least one order of magnitude in all soils measured, indicating substantial potential for Fe reduction. Our data point to the importance of localized CH4 production “hot-spots” that persist despite the widespread presence of alternative electron acceptors. The impact of climate change on precipitation regimes in humid tropical ecosystems remains highly uncertain, yet empirical and theoretical evidence points to an increase in the magnitude, variability, and importance of extreme events in some regions (Karl and others 1995; Romps 2011). Our data suggest that short-term increases in precipitation over the scale of weeks may have little additional impact on CO2 and CH4 fluxes from upland humid tropical forests. Such precipitation variability appears increasingly common at our site, reflected in highly variable inter-annual rainfall between 1989 and 2011 (2600–5800 mm y−1, F. Scatena, unpublished data). Our results contrast with temperate wetland ecosystems, where variation in precipitation and water levels appear to play a defining role in constraining O2 availability, terminal electron-accepting processes, and greenhouse gas fluxes (Ponnamperuma 1972; Ratering and Conrad 1998; Jungkunst and Fiedler 2007; Knorr and Blodau 2009). The TEAP model, which posits that terminal electron acceptors will be reduced according to thermodynamic favorability during periods of high moisture, may be less useful for understanding plot-scale dynamics in upland humid tropical forests given their high spatial heterogeneity. Spatial segregation of redox processes within soil aggregates likely allows Mn and Fe reduction and methanogenesis to occur despite the close proximity of O2. Given adequate baseline moisture availability, increased precipitation may have relatively little impact on microbial processes occurring at the aggregate scale. Droughts that cross a moisture threshold where anaerobic microsites disappear, however, may provoke a stronger biogeochemical response. We found that sustained high and variable soil moisture regimes had relatively little impact on soil redox biogeochemical processes and greenhouse gas fluxes from a humid tropical forest soil over a 25-day field experiment. Pairwise relationships between moisture and redox indicators that reflect constitutive spatial soil heterogeneity, however, did show significant relationships in spite of relatively weak effects from water-addition treatments themselves. These results suggest that moisture provides an adequate proxy for spatial variation in redox reactions, but less utility for predicting temporal variation over the timescale of our study. Although spatial variability in bulk soil O2 concentrations and trace gas fluxes generally exceeded temporal variability, we documented relatively large temporal variation in NO3, Mn(II), and Fe(II) pools. Anaerobic redox processes co-occurred with relatively high O2 concentrations in close proximity, showing a relative decoupling between moisture and O2 at the plot scale. Overall, our data suggest that the TEAP model of sequential electron-acceptor depletion over timescales of days to weeks is not a useful conceptual model of redox-sensitive biogeochemistry in this ecosystem. We observed net Fe reduction and a non-significant increase in CH4 flux in the continuous water-addition treatment at the end of the experiment, suggesting that long-term periods (>24 days) of sustained soil moisture exceeding field capacity might ultimately stimulate anaerobic processes beyond background rates. Such sustained rainfall, however, is difficult to envision given the present stochasticity of precipitation at this site. Mean soil CO2 fluxes displayed a negative relationship with reducing conditions, as predicted by thermodynamic theory, but surprisingly, water additions did not suppress CO2 fluxes over the timescale of our study. Biogeochemical models typically incorporate inhibitory effects of moisture on soil respiration. Our results suggest that soil respiration in humid tropical forests may be resistant to short-term (days–weeks) increases in moisture, and suggest caution in applying models developed for temperate soils in humid tropical ecosystems. Furthermore, water supplementation consistently suppressed N2O fluxes, contrasting with results from relatively drier ecosystems. Longer experiments encompassing a broader range of moisture conditions and humid tropical ecosystems are necessary to confirm these findings. A relatively wide range of soil moisture may have little short-term impact on CO2 and CH4 fluxes from humid tropical forests, questioning the representation of these processes in current biogeochemical models. We thank D. Kirschner for herculean field assistance, M. Almaraz, A. McDowell, J. Potter, C. Torrens, and S. van Bloem for logistics, and R. Rhew and two anonymous reviewers for comments. SJH was supported by the Department of Energy Office of Science Graduate Fellowship Program (DOE SCGF), made possible in part by the American Recovery and Reinvestment Act of 2009, administered by ORISE-ORAU under contract no. DE-AC05-06OR23100. Funding was provided by NSF Grant EAR-08199072 to WLS, and the NSF Luquillo Critical Zone Observatory (EAR-0722476) with additional support provided by the USGS Luquillo WEBB program. This research was also supported by Grant DEB 0620910 from NSF to the Institute for Tropical Ecosystem Studies, University of Puerto Rico, and to the International Institute of Tropical Forestry USDA Forest Service, as part of the Luquillo Long-Term Ecological Research Program.